Why this industry? I wanted to build an empire around making people feel beautiful. Favorite Service? 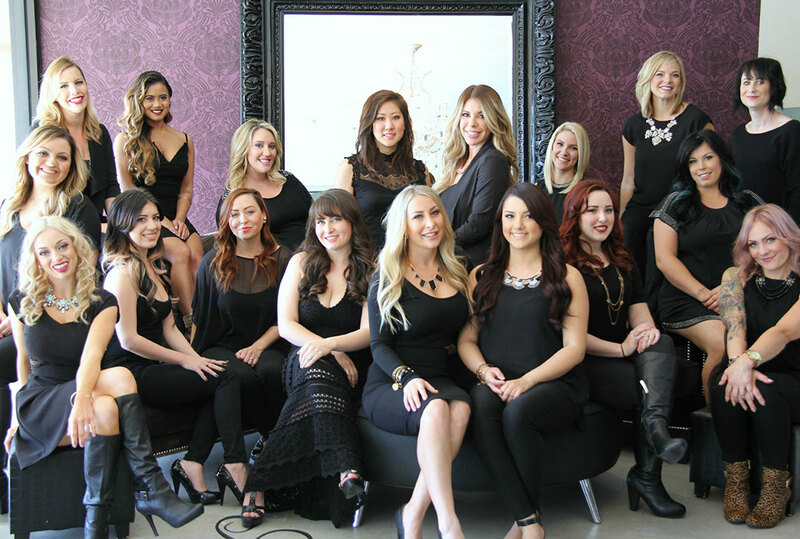 Blondes, Ombres and Extensions! Hair History: 13+ years. Started school at 16 1/2 and worked in salons since. My great grandma and grandma both did hair and inspired me to do so as well. Why this industry? I just love a good transformation. When a client feels confident and loving her hair, it always make my day! Favorite Service? Bayalage is my favorite because there are so many ways you can tweak it to each person. Love styling hair and giving the hair a nice curl. Favorite Product? Kenra Blow Dry Spray. It’s Amazing! Hobbies? Always love going to Disneyland to eat a turkey leg and a churro. Why this industry? I enjoy the creativity of the industry and making people look and feel beautiful. Favorite Service? I really enjoy the challenge of a good color correction. Hobbies? Heavy weightlifting, reading, hanging with my baby boys. Hair History: Graduated from Paul Mitchell, and I assisted for six months before venturing out on my own. I learned quite a bit from the two stylists I assisted for. Hometown: Orange County born & raised. Hair History: Graduated from Salon Success Academy and assisted at Addiction Salon for 8 months. Why this industry? Since I was a kid I loved doing hair and I was really good at it. My life goal was to be in the production industry for hair and makeup. I now get the best of both worlds in this salon and on set. One word to describe yourself? Fierce! Favorite product? Unite 7 Seconds Detangler – my right hand and go to!